Interressing by the glaring work of Nikel, is it a tutorial on the way to create these portraits from ancient picture ? Nikel has some can be put one to disposition but I didn't find anything in postses. Well, you can try by sending him a Private Message too. Just ask him directly and maybe both of you can create togheter a tutorial with your experience to help the community. Nikel, this could be just what I need! I have been trying to use Gimp - and slowly getting the hang of it - but more than happy to use Paint.NET if I can get some advice. But if you can provide any advice on how to resize images like this or how to add the coloured oval behind portraits it would be of great help. Thank you Nikel, your answer perfectly suits me. I wrote drawning but it was necessary to understand coloring. My school English is very far! Okay with Hobbes, if you can provide any advice on how to resize pictures or how to add the coloured oval behind portraits it would be of great help. Hobbes, regarding on how to add the coloured oval. Have used two ways and I think that both are wrong I will tell you how I do it right now. And about resizing, well, should be easy. The RGB on the coloured oval in NCP is 224 198 152. What is RGB? I know that numbers from Photoshop, putting the cursor on a color and the program will tell you the data. Be careful in the lower border so that you do not paint beyond it. Save the picture as .png (as the original), but rename it so that you do not lose the original! You will get something like this. A lot of trials and errors may be needed to get a decent portrait. Anyway the fire test is the look in the game. To test your graphic in the game. Select a graphic from the units folder that you know that appear at the beginning of a scenario. In this case the own Napoleon is good, but can be any just to test. Copy the file Unit_FRA_Napoleon, paste in "Napoleon's Campaigns\NCP\Graphics" and rename to Unit_FRA_Napoleon2. Now copy your modded file to that folder and rename it like the original Unit_FRA_Napoleon. Copy it to "Napoleon's Campaigns\NCP\Graphics\Units" and replace the original. I wait with hurry this week-end to try your method. And when I read on your post " To be continued... " then, I am delighted. This is really wonderful Nikel - it will save me hours! We need the second portrait for the map, this one is located on the folder "Napoleon's Campaigns\NCP\Graphics\Armies&Fleets"
Open two times the portrait of our friend Dupont, one to work on it and the other as reference. Copy the file Army_FRA_Napoleon, paste in "Napoleon's Campaigns\NCP\Graphics" and rename to Army_FRA_Napoleon2. Now copy your modded file to that folder and rename it like the original Army_FRA_Napoleon. Copy it to "Napoleon's Campaigns\NCP\Graphics\Armies&Fleets" and replace the original. How to improve that result? 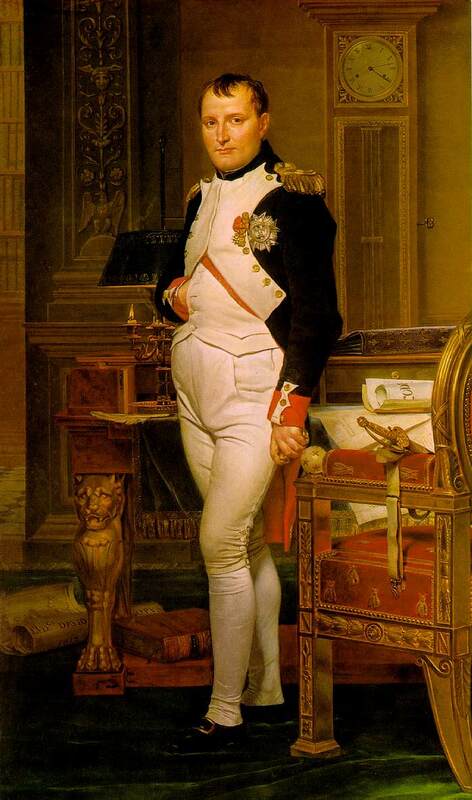 If you compare the original portraits with the modded Napoleon, the face has a pale or white look in the originals. Encountered this problem with the russian portraits modded more than a year ago. Like Napoleon, they were extracted from coloured paintings of the period. I hope I get a chance to try some of this out tomorrow! Hobbes, some time ago you requested William Phips? Tried a little bit, but with the usual problem looks-different-to-the-stock-ones, finally did not post it But perhaps you consider it valid? Wonderful Nikel! I will certainly add him to the scenario. I'll stick him in a screenshot when it is up and running and we can see how he fits in. How to color a black and white picture ? Thank you for your explanations. Me successful with photos in color but I have difficulties however to pass a photo in black and white to a photo in color. How to color a black and white picture ? I use Paint Shop Pro but I am beginner. I think that all software function in the same way. Your method will put me on the good path. Yes Glaude, there is a last missing part, how to color black and white pictures. For this part I use Photoshop. The fundamental tool to color a black and white portrait is the Color Replacement Tool, because when you apply a color to a black and white picture the shadows of the picture are preserved, thanks to the tolerance. The hair, perhaps too youg for him, or not? With the picture above you can apply now what we learnt before, remove the background, increase contrast and reduce brightness, add it to the colored oval and sharpening, in this case only applied the value of 1. For displaying only did the units portrait, and here is the result, with a picture in-game. Hope it is good enough. Who said NCP had no diplomacy? Superb thread Nikel. Thanks for taking the time to do this. I haven't tried with my portraits yet as I am still messing with the events but I will certainly do so soon. I'll let you know how I get on. Thank you very much Nikel, you could not be clearer. Paint.net rocks. I love free programs. bigus wrote: How did I miss this Thread?